For other uses, see Snout (disambiguation). For other uses of muzzle, see Muzzle (disambiguation). 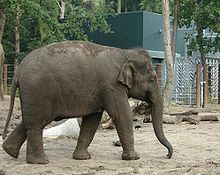 Asian Elephant (Elephas maximus indicus). The extended proboscis is called the "trunk" and is used for a wide range of purposes, including feeding, drinking, exploration, and social grooming. Snouts are found on many mammals in a variety of shapes. Some animals, including ursines and great cats, have box-like snouts, while others, like shrews, have pointed snouts. Pig snouts are flat and cylindrical. The muzzle begins at the stop, just below the eyes, and includes the dog's nose and mouth. In the domestic dog, most of the upper muzzle contains organs for detecting scents. 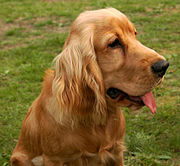 The loose flaps of skin on the sides of the upper muzzle that hang to different lengths over the mouth are called flews. It is innervated by one of the twelve pairs of cranial nerves. These nerves start in the brain and emerge through the skull to their target organs. Other destinations of these nerves are eyeballs, teeth and tongue. The muzzle shape of a domestic dog ranges in shape depending upon the breed, from extremely long and thin (dolichocephalic), as in the Rough Collie, to nearly nonexistent because it is so flat (extreme brachycephalic), as in the Pug. Some breeds, such as many sled dogs and Spitz types, have muzzles that somewhat resemble the original wolf's in size and shape, and others in the less extreme range have shortened it somewhat (mesocephalic) as in many hounds. 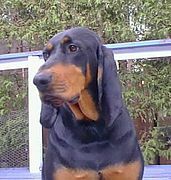 The flews of the Black and Tan Coonhound overhang the lower jaw. Look up snout in Wiktionary, the free dictionary.